(Nanowerk News) A computational technique to analyze how water vapor condenses on a surface patterned with an array of tiny pillars has been co-developed by an A*STAR researcher. Calculations carried out using this technique reveal that water droplets preferentially form either on top of the pillars or in the gaps between them, depending on factors such as the height and spacing of the pillars ("Numerical Study of Vapor Condensation on Patterned Hydrophobic Surfaces Using the String Method"). 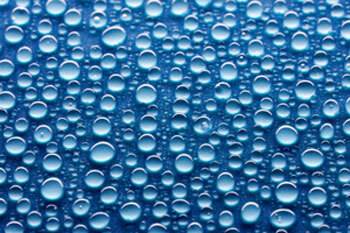 Superhydrophobic surfaces, which strongly repel water, are promising for many applications. Surfaces that strongly repel water, known as superhydrophobic surfaces, are important for many industrial applications as well as self-cleaning, defrosting and anti-icing surfaces. Scientists have discovered that inherently water repellent surfaces can be made much more water repellent by patterning them with micro- or nanoscale structures. On such surfaces, water droplets can either be suspended across neighboring protrusions or impaled between them. The transition between these two states has previously been explored experimentally and theoretically. Furthermore, the effect of microstructures on vapor condensation has been studied experimentally, but there have been few computational studies of how droplets initially form by condensation from vapor. Now, Weiqing Ren from the A*STAR Institute of High Performance Computing and Yunzhi Li of the National University of Singapore have systematically analyzed how micropillars on a hydrophobic surface affect the condensation of water vapor. To do this, they used a powerful computational technique known as the string method, which Ren developed in a previous study. Ren and Li used the technique to investigate the effect of parameters such as the height and spacing of the micropillars and the supersaturation and intrinsic wettability of the surface on the condensation process. They discovered that both the pathway and configuration of the initial nucleus from which droplets form — known as the critical nucleus — depends on the geometry of the surface patterns. In particular, the scientists found that for tall, closely spaced pillars on a surface with a low supersaturation and low wettability, the critical nucleus prefers the suspended state, whereas for the opposite case it prefers the impaled state. By generating a phase diagram, they could determine the critical values of the geometrical parameters at which the configuration of the critical nucleus changes from the suspended state to the impaled state. In the future, the researchers intend to study how fluid flow affects nucleation and the wetting transition on patterned surfaces.